You are here: Home / Travel Blogs / Africa / Fez 24 Hour Trip: What All to See and Do ? Fez 24 Hour Trip: What All to See and Do ? 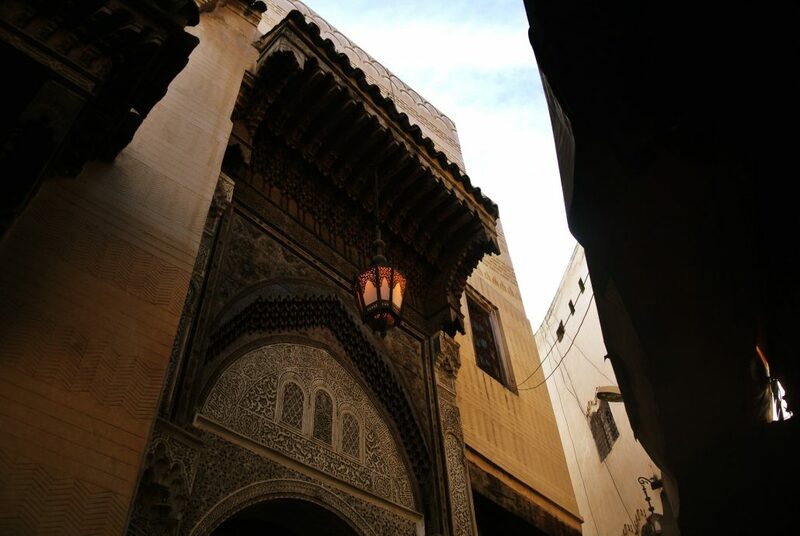 24 hours in Fez Medina will be enough to take you through the heart of the town. The time spent will reveal as to why Fes is considered as the cultural capital of Morocco. Exploring Fez transports you to an era when the trade was thriving and you will witness it first hand when you walk through the narrow lanes of the Medina Fes el Bali. Within an area of 540 acres and in a span of 24 hours, I was able to witness the world’s oldest functioning university, mosques and alleyways dedicated to different goods like perfumes, leather products, cloth dyeing, copperware, and more. You too can experience all of this for yourself on your trip here. 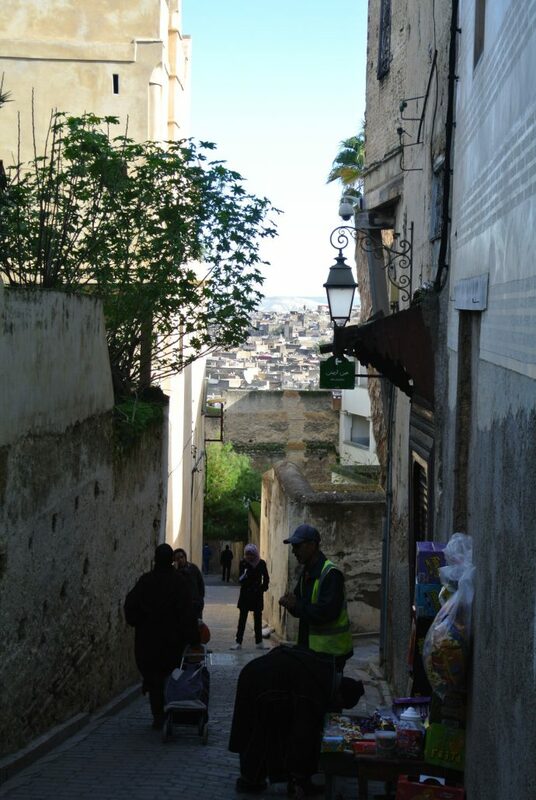 In just 24 hours in Fez Medina, you will see how the town seamlessly functions as an ecosystem within its walls. I’ve written the current blog on 24 hours in Fez Medina with the intention of assisting fellow travellers. My travelogue will help you understand the subsequent aspects better – safety tips to follow during your 24 hours in Fez Medina, where to stay in Fez, places to visit within 24 hours in Fez Medina and what to shop during the 24 hours in Fez Medina? 24 Hours in Fez Medina – What All to Know? While planning a trip to a new region, it is important that you understand what is the optimum time to visit is and which is not. Each destination has its own best and worst seasons as far as tourism is concerned. So let me highlight this aspect right at the outset. Market place for locals to buy vegetables, fruits, olives, meat and more. Fez is a year-round destination of Morocco with travellers streaming from across the world, especially neighbouring European countries. The following time periods are suggested for a good time in Fez. Spring and autumn are the best time to enjoy 24 hours in Fez Medina because the weather is pleasant. Summer might not be the best time because the temperatures are high with the mercury hitting 36° C during the day. Also, since it is vacation time in Europe, there will be a lot of tourists which you might want to avoid. 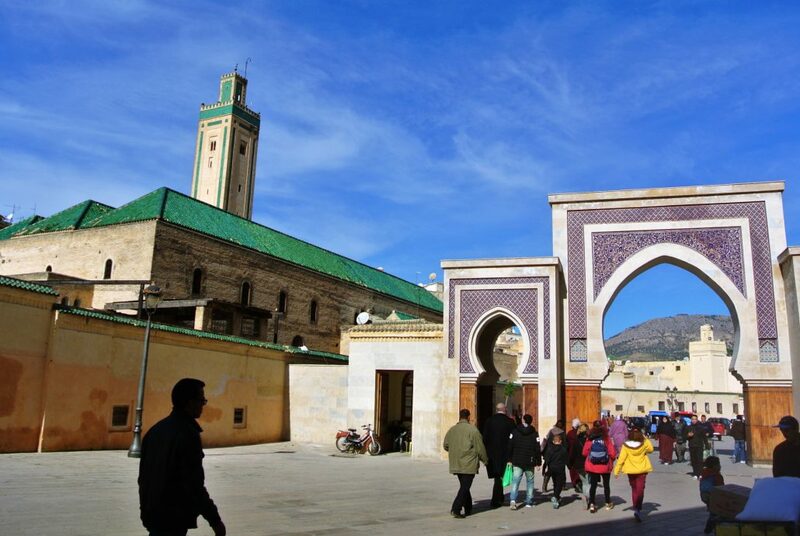 Winter is a great time to make the most of your 24 hours in Fez Medina as there are lesser tourists. It is cold in the night with mercury dipping as low as 5°C, so carry a lot of warm clothing. Day time is slightly cold but the warm sun makes it extremely pleasant to have fun in Fes. Before proceeding further, I’d like to share some pictures of my time spent in and around Fez. The region is unique and will come across as different from other parts of the world. Asphalted roads a few km outside Fel el Bali. Picture credits: Supriya A.N. Inside the Medina. Picture credits: Supriya A.N. I’m listing two safety tips to keep in mind while spending 24 hours in Fez Medina. Follow them for a good trip. Morocco is a conservative country. Fes el Bali is the ancient face of Fez and hence most men and women are dressed in local attire here. As travellers, dressing modestly is important as there are mosques you would like to enter in Fes el Bali. Men and women can wear full-length trousers and a comfortable t-shirt. Carrying a stole is a good idea as it can come in handy during the trip. This is a dicey issue. Few people would love to pose and there are others who do not like themselves being photographed in Fez. Always, seek permission before clicking. Obviously, it’s not practically possible to take permission before clicking hundreds of pictures but be cautious and try to respect their privacy at the same time. Your 24 hours in Fez Medina will give you so many opportunities to click great pictures especially those who are into street and portrait photography. So don’t only concentrate on the locals. Inside the Riad in Fes el Bali. Picture credits: Supriya A.N. Where to Stay for Spending 24 hours in Fez Medina? 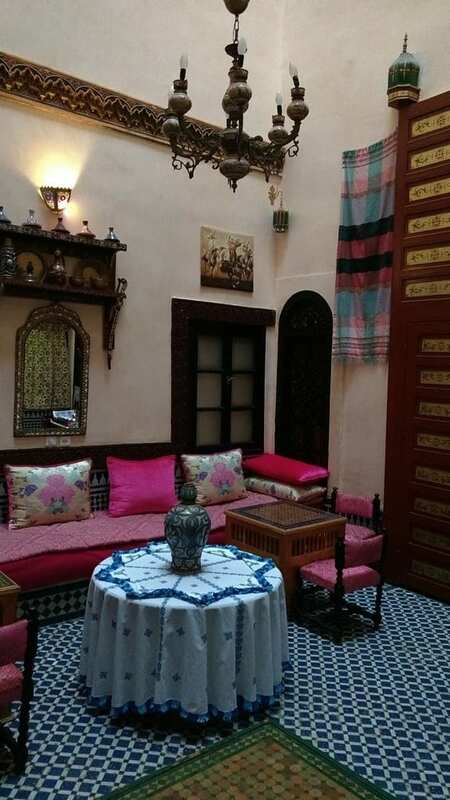 In your trip comprising 24 hours in Fez Medina, I strongly recommend that you stay in a riad in Fes el Bali. While you are booking a room, look for one on the topmost floor like the 3rd floor or a room which has access to the terrace. The views of the Medina from the comforts of your room is priceless. That is because you will get panoramic views of the Medina below you. Also, you will hear the early morning call for prayers from the nearest mosque, birds chirping, and a glimpse of day to day events. During sunrise, all the buildings in the Medina will turn off their lights and as the sun rises higher, the change in the landscape from glittering lights to a sea of buildings is worth the glimpse. Booking a room in Fes el Bali gives you the opportunity to stay and experience authentic Moroccan life here. As you walk in the alleyways you will come across a bakery where fresh bread is being baked every day. You will find ladies dropping their kids to school. You will walk past stray cats loitering on the streets. Local men dressed in traditional djellaba with the hood neatly resting on their head going by their lives is a common sight. 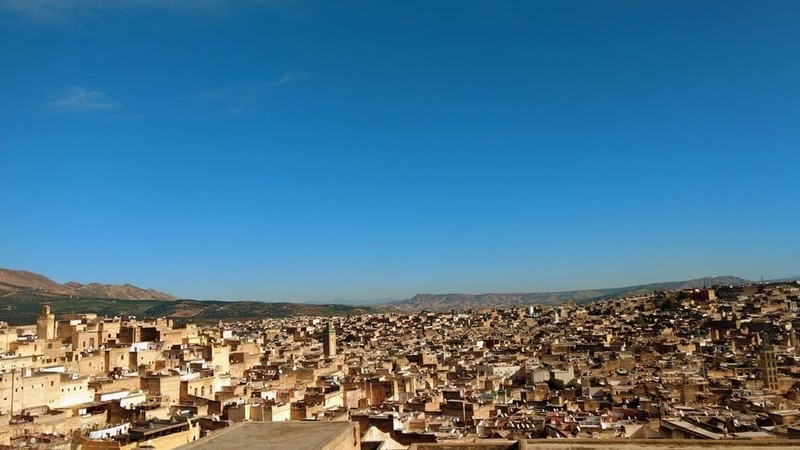 You will miss out on the nuances of this medieval city if you stay on the other side of Fez which is modern and looks like any other 21st-century city in the world. While you’re spending 24 hours in Fez Medina, there are numerous places for you to visit as a traveller. I’m listing them for you below. Fes el Bali is the ancient side of the 21st century Fez. The Medina has thousands of narrow alleyways and is the world’s largest car-free area. At the end of your 24 hours in Fez Medina, trust me your legs might hurt after all that walking but your heart will be full of memories. These alleyways are like a maze. You might end up walking on the same street twice if you do not pay attention. These narrow streets are wide enough for one way foot traffic. Every now and then you will have come across donkeys carrying goods, dangling on both the sides of the poor animal. You have to stick yourself against the wall to make way for these beasts of burden. View of Fes el Bali from the terrace. Picture credits: Supriya A.N. This is the starting point of your 24 hours in Fez Medina. This ornate city gate is the main entrance to Fes el Bali. It is fondly called as the Blue Gate of Fez owing to the bluish-purple mosaic tiles that adorn the gateway. As soon as you enter, you will see a bunch of kids playing football during the afternoon. There are juice shops and eateries at the entrance. Buy yourself a glass of orange juice the way I did. It is refreshing and gives you the energy to explore the Medina. The minaret that you see on the left as soon you enter Bab Bou Jeloud belongs to the Bou Inania Madrasa. The entry fee is 20 MAD (2 USD). There is a big courtyard with the walls and floor adorned with intricate wooden carvings. You can appreciate the art and craftsmanship put into all the details on wood and stone from the floor to the ceilings. It is wise for female travellers to respect local customs and dress appropriately if you intend to visit the mosque. Right outside the entrance and opposite to the mosque is a lane is the famous Water Clock of Fez. The minaret on the left is Bou Inania Madrasa and the one in purple is the Bab Bou Jeloud gateway. Picture credits: Supriya A.N. This interesting piece of architecture was used to announce the time. It was built in the 13th century and the restoration work is currently going on to bring it back to life. This ancient water clock happens to be one of the most visited spots amidst the thousands of other structures found in the region. The clock consists of 13 windows. It also comprises of platforms carrying brass bowls. How this clock has been functioning has long been a mystery. Every street inside Fes el Bali is selling something. So the whole place can be considered as a giant marketplace. This is the first stretch of the market when you enter from Bab Bou Jeloud. In your 24 hours in Fez Medina, you will come across a lot of marketplaces with each alley dedicated to a special craft. In the Talaa Kebira Market, locals buy their regular supply of vegetables, meat, groceries, and other day-to-day items. The market is obviously crowded and you can see ladies busy negotiating with the vendors. When you are busy clicking pictures, a stray cat will brush against your leg and run away. 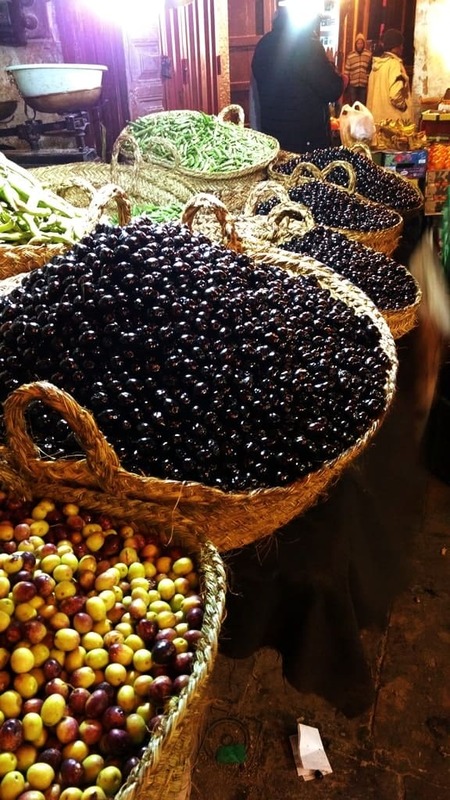 You will find baskets full of green and black olives being sold. It reminds you of the olives that you just had for breakfast at the riad where you are staying. As you walk past the market, you will come across eateries where they sell local delicacies like bread, snail soup, Shawarma, and more. A lot of locals can be seen savouring a meal here. There is no clear distinction that separates one market from another. There are a bunch of shops that sell perfumes all located next to each other in one stretch. As you walk further, the number of perfume shops thin out and there is a stretch of shops selling lamp shades. So, this is how you will find alleyways dedicated to each type of handicraft that is being sold. There are leather goods, jewelry, ceramics, rugs, leather, shisha, and more. Heaps of olives being sold on a street. Picture credits: Supriya A.N. 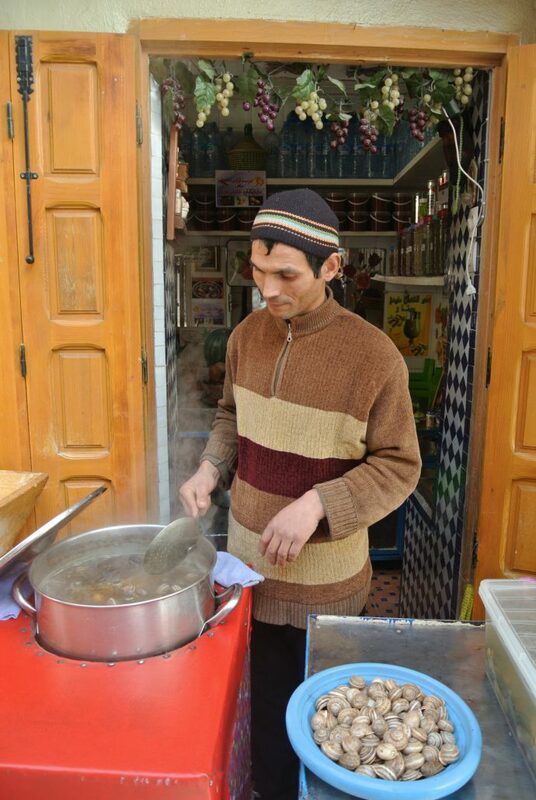 A vendor selling snail soup at his stall. Picture credits: Supriya A.N. This is Fes el Bali’s oldest marketplace. This shaded stretch has artisans selling ceramics and traditional cosmetics. Pottery in Fez is considered as one of the best compared to Southern Morocco. It is attributed to the clay found in this region. You can buy the typical blue Fassi pottery in the form of a little tajine, plates or bowls. 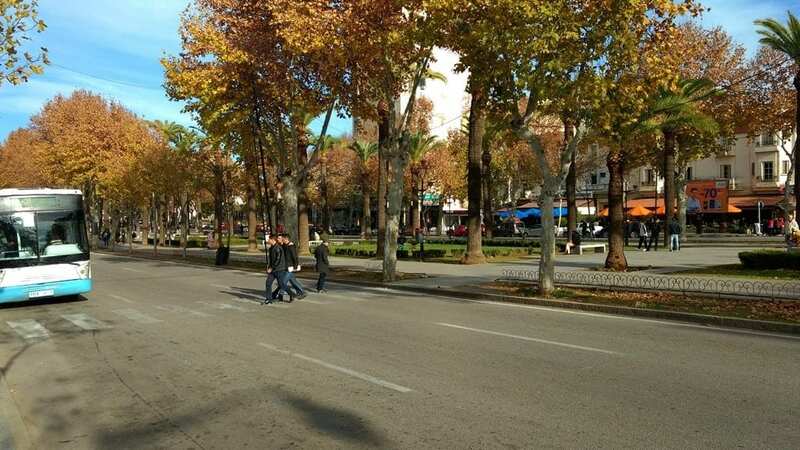 You can recognize this place by the presence of two large trees in the souk. That should be your reference point. You can buy various cosmetic products here like perfumes, rosewater, kohl, argan oil, and henna. At the end of the Henna souq, you will find a plaque which says that this was the spot for the Maristan Sidi Fredj. This used to be a psychiatric hospital built by Merenid ruler Youssef Ibn Yakoub in 1286. It is considered as the earliest psychiatric hospital in the world which was functioning until 1944. Adjacent to the Maristan Sidi Fredj, there are shops which prepare medications for centuries, and they are running even to this day. As you approach this alley, you will hear the rhythmic clanging noise of metal being hammered. 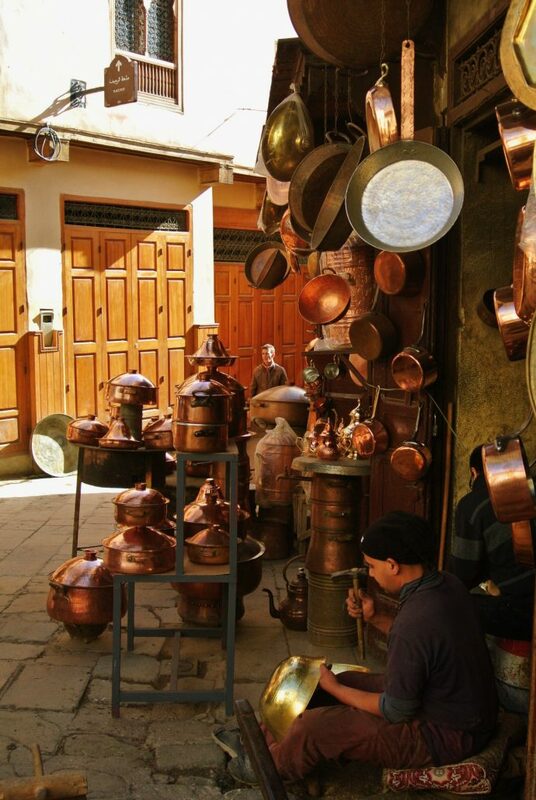 As you enter the square you will see craftsmen working on copper and brass to produce pots and other souvenirs. While Henna souk looked shades of blue due to the Fassi pottery display, the Seffarine Square looks shades of brown and golden. All thanks to the copper and brassware kept on display here. A busy artisan on Seffarine Square. Picture credits: Supriya A.N. You don’t need directions to go here. Your nose will guide you to this place. The stench of leather is so strong that you will walk towards the tannery yourself. As you walk closer, you will find a lot of leather shops selling shoes, pointy slippers called babouches and bags made of leather. An obvious indication that you are near the tannery. As you get closer to the tannery, local shopkeepers offer mint leaves to sniff on to ward off the unpleasant smell of the leather. You have to pay 10 – 20 MAD (1 – 2 USD) per head to enter the terrace or balcony of one of these shops to catch a glimpse of the tannery. As you enter the terrace, the tannery reveals itself. You will notice numerous pits of various colours. All the dyes used here are natural products like saffron, turmeric, pomegranate extract, and poppy to name a few. There are workers standing on the wall of these pits busy dyeing the leather piece. They are so used to visitors watching them and their work being photographed that they are nonchalant about it. Visitors are not allowed near the pit and we can only observe it from the terraces of these shops. I went there during December when the weather is cold. But these men were toiling and seemed so passionate about their work in sparse clothing. You can spend a few minutes here or more depending on how far you can bear the stench. This will definitely be the most memorable landmark in your 24 hours in Fez Medina. 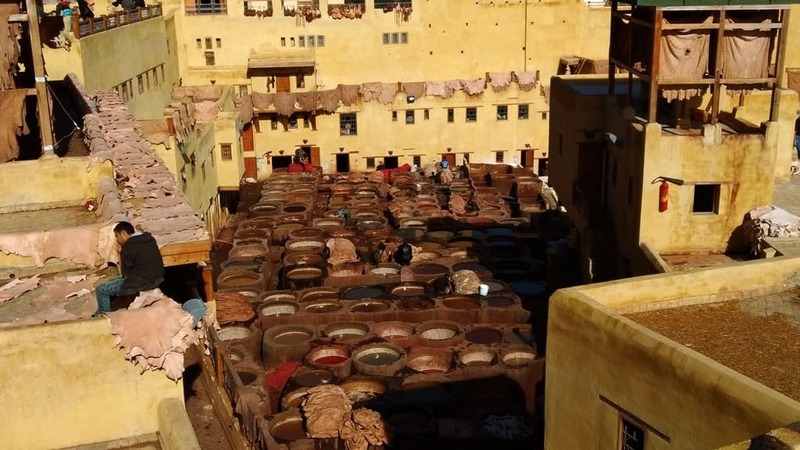 A view of the Chouara Tannery. Picture credits: Supriya A.N. 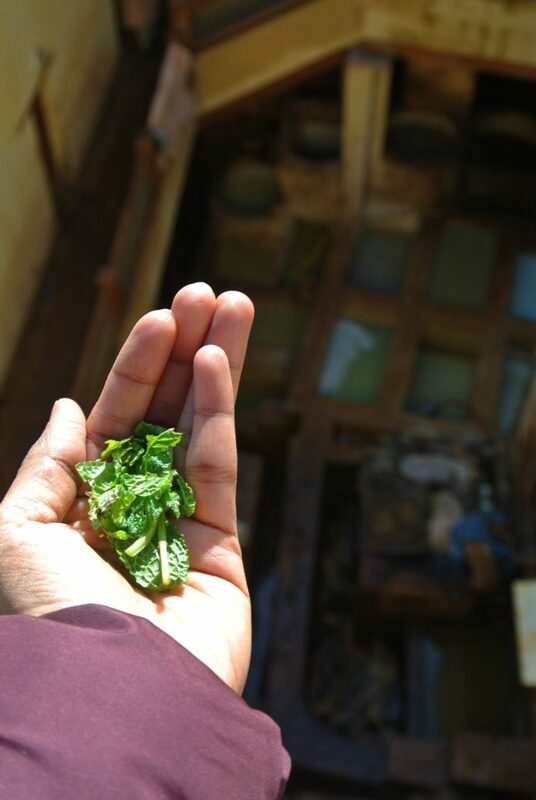 The mint leaves that I was made to smell before visiting the Tannery. Picture credits: Supriya A.N. A souk is basically a market place. The Souk Al-Attarine comprises of a line of shops in one of the alleys of Fes el Bali dedicated to the sale of spices, dry fruits, oils and dried herbs. This place is pleasant to walk by because of the aroma that wafts in the air. At the end of the alley is the Al-Attarine Madrasa. The Al-Attarine Madrasa is located at the entrance of the perfume market. The interiors are exquisite with delicate mosaic art and carved cedar wood that adorns the walls. There is an entry fee of 20 MAD (2 USD). Head upstairs to see the green glazed roof of the buildings around the Madrasa. The Madrasa is open daily from 8.30 am till 12.30 pm, and then from 2.30 pm to 6.30 pm. The entrance to Al-Attarine Madrasa. Picture credits: Supriya A.N. This important place of learning has been recognized by UNESCO as the oldest continuously operating and degree-granting university in the world. This is the oldest university in the world which continues to function today. This university was founded by a lady called Fatima al-Fihri in 859 AD. Sadly, the students at the university must be male to attend. Not to forget Muslim. Women students are not allowed here. The Andalusioan Mosque is considered as one of the oldest mosques in the world. It was built in the 9th century. Fleeing suppression in Cordoba, Spain in 818 AD, families settled near the river of Fez. The new settlers started building a mosque and till date, it has gone through a lot of renovation since its foundation. The architecture of the Mosque is to be admired. It’s beautiful. What to Shop During the 24 Hours in Fez Medina? I personally feel that people consume more tea than water in Morocco. The art of pouring tea from a height into the glasses will make you fall in love with all the teaware. The teapots are extremely elegant and it will make for good travel memorabilia. The teapots will cost you over and above 150 MAD. The glasses in which you drink the mint tea are beautiful in itself. You can find them in various colours with intricate design on them. You can buy a set of six for around 474 MAD. Another suggestion is to buy a leather bag or a leather jacket. Check in a few shops, compare the price and then buy. Try bargaining for 1/3rd of the price the vendor quotes. 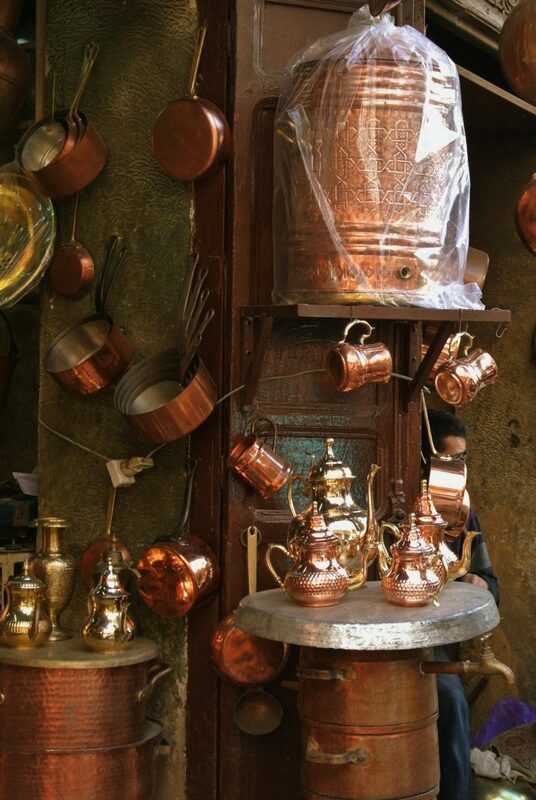 Teapots sold in Fez are surely worth taking home. Picture credits: Supriya A.N. I really hope you enjoy your time in Fez as this city has so much of its history safely guarded even in the 21st century and many years to come. You will love Fez so much, that you will be craving to visit this great city again. May be for a little longer next time. My 24 hours in Fez Medina just did not suffice. I intend to sign up for a cooking class to learn authentic Moroccan cuisine or to learn Arabic the next time I am here. 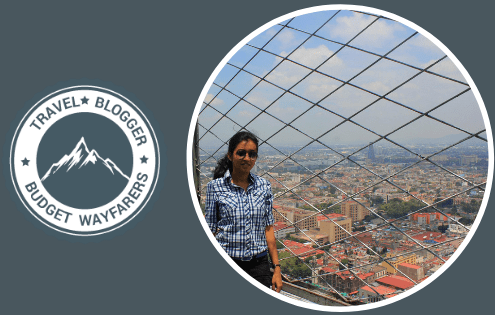 Supriya hails from the garden city of Bangalore in southern India and is always on the look out for fun experiences across the globe. After scuba diving in the Mediterranean, counted shooting stars in the Sahara, flying in a helicopter over Barcelona, she now aims at horse riding in the Mongolian steppe, pet whales off the coast of Baja California and more. She narrates her travel experiences on her travel blog called Inking Miles. She loves salad over pizza, non-fiction over fantasy, movies over sitcoms. She constantly flips pages of travel books, hugely inspired by Michael Palin and Pico Iyer. She also keen on the arduous journey the snow geese make every year from the Canadian Artic to the Gulf of Mexico every winter. THIS POST ENTITLED, “FEZ 24 HOUR TRIP: WHAT ALL TO SEE AND DO ?” IS AN EXCLUSIVE PROPERTY OF BUDGET WAYFARERS. ANY INDIVIDUAL OR ASSOCIATION INDULGING IN PLAGIARISM WILL BE DEALT WITH STRICTLY. IF YOU WANT TO USE INFORMATION FROM THE ARTICLE ABOVE, KINDLY QUOTE THE SOURCE. 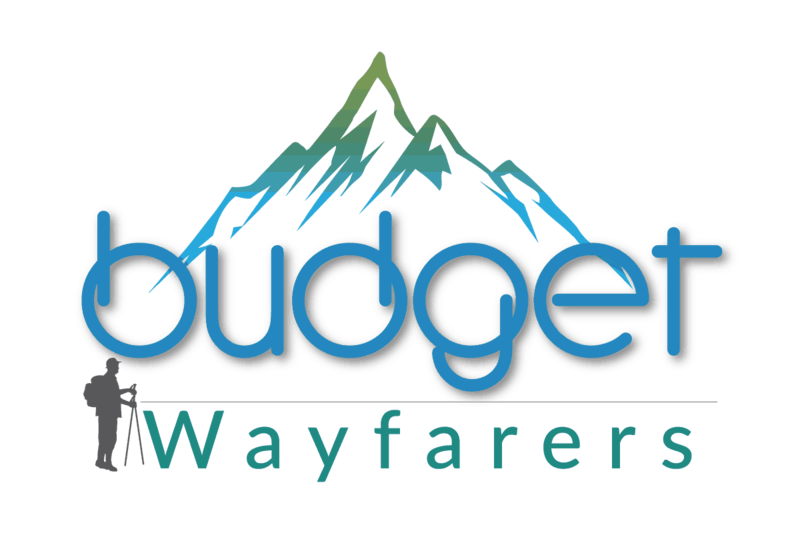 https://www.budgetwayfarers.com/wp-content/uploads/2018/11/24-hours-in-fez-medina.png 315 560 Budget Wayfarers https://www.budgetwayfarers.com/wp-content/uploads/2018/04/1200X800.png Budget Wayfarers2019-02-05 12:51:362019-02-06 12:06:22Fez 24 Hour Trip: What All to See and Do ?